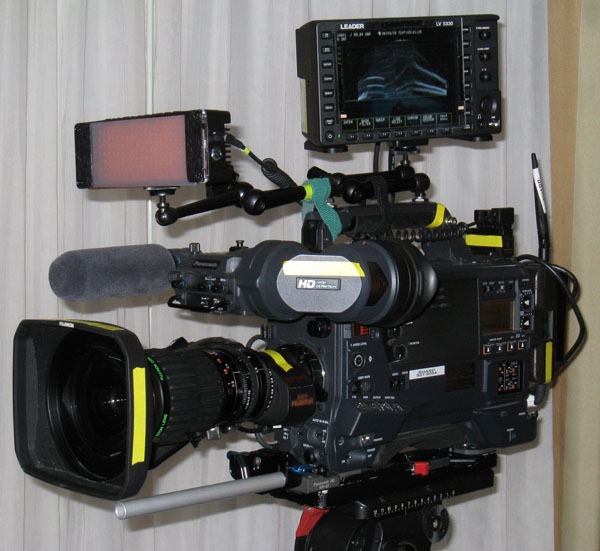 I recently bought the Leader LV 5330 Multi-SDI Monitor. Having this much image control riding on the top of the camera has totally changed the way I approach my work. With it, there's never any doubt about the integrity of my HD images and that peace of mind was worth the price of the unit alone. The waveform and vectorscope are top notch. Sometimes when running and gunning with only a black and white viewfinder, you're never quite sure if your white balance is the best it can be or if you're too low light. In those low light situations you start gaining up and lifting the gamma and it looks acceptable in the viewfinder but when you look at it on a color display it can be a little shocking. With the trusty LV 5330, all the tools you need to create the best possible image with the camera are sitting right on top of it. The picture display is equally brilliant. It's incredibly sharp and makes focus evaluation instant. It does have a few shortcomings though but more on that in a bit.. The new Cinezone/Cinelite tool is incredibly powerful (look to this blog soon for a separate post on it.) I'm finding Cinezone to be particularly useful when shooting outside or in places with a lot of ambient light pollution. Looking at a washed out picture display in the sun, it's very difficult to tell what you've got. With a flick of the Cinezone switch, all of your IRE values are converted to corresponding color (like False Color on the RED but better) and you can immediately tell where all your values are. It's also useful when lighting an interview or a close up because you can very quickly work out your contrast ratios. To be honest, you can do the same thing on the waveform but Cinezone is just so much more intuitive. All of the other features - status, audio, multi displays, screen capture, etc. are great but I want to address what I consider to be a pretty major shortcoming and this feature is kind of a no-brainer which is why I'm surprised it was omitted. 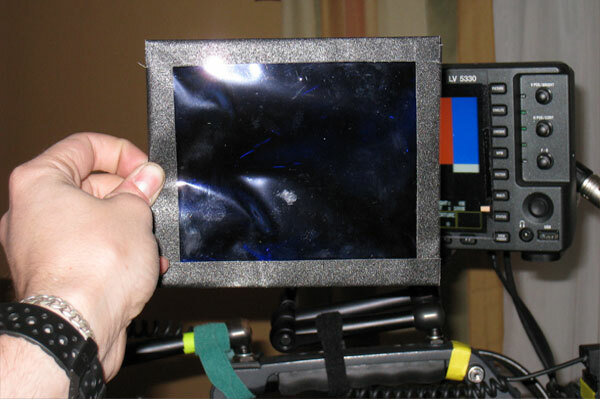 That missing feature is a "Blue Only" switch on the SDI picture display. Someone at Leader told me that the picture display on this scope doesn't need to be calibrated because it perfectly displays the SDI signal as it is. This is not the case. If that was so, then why are there brightness, chroma, and contrast adjustments? Out of the box at its default values, the LV 5330 is a bit bright and WAY too desaturated. It's really not accurate. If there was a Blue Only switch you could quickly see that the display needs adjustment but there isn't so I devised my own method. I doubled up a piece of Congo Blue gel - the bluest of the blue gels with the highest transmission loss. This gel when placed on the face of the display only passes blue light and as I expected, the color bars were way out of alignment. By turning the Chroma up to about 120% they finally lined up and the display's colors were as accurate as you'd expect from a small monitor like this. The LV 5330's big brother, the LV 5380 has a blue only. So why doesn't the 5330? It's a critical feature. I don't mind carrying around a bit of blue gel but to be able to do it in the scope would make so much more sense! I don't know if this is something that could be done with a firmware upgrade or if it was something that was cut to keep cost in line. For 7000 dollars, this is an incredibly powerful tool. It's a real bargain for sure but it sure would be nice to be able to properly tune the picture display. Also, the viewing angle is a little tight. If you stand over it, it looks brighter and greener. You really have to stand right in front of it to read the picture display properly. A few other minor gripes are that when you switch to Picture-Multi display like Picture / Waveform, you lose your brightness, contrast, and chroma adjustments leaving you with the de-saturated, slightly brittle, default picture display. Additionally there's no 16:9 switch on the composite viewfinder feature. This thing has the ability to display an analog composite image from any source but there's no way to correct the aspect ratio. Annoying. My list of improvements is vastly small however compared with all the things they got right with this monitor. It really is a game changer and the price is just right. It's not cheap but with it, you've basically got an engineering tent riding on top of your camera. The technology is just incredible.